The Agency for Parks and Recreation (APR) will holld for the first time in Albania on 1 and 2 September at 10:00 the Kites Festival. The festival takes place at the Artificial Lake Park and APR and are invited all to be part of this particular festival. "The Kites Festival for the first time in Albania, the Artificial Lake Park awaits you on September 1 and 2. Will you be part of a colorful balloon festival? Come to the southern lawn of the Great Park of the Artificial Lake of Tirana on September 1 and 2. The Agency for Parks and Recreation organizes for the first time in Albania a Kite Festival! Every kid who has a kite but also anyone who needs help to build it can be part of the magic of colors and lust. "Do you know what color has the wind? The clouds? The sky? What about that magical feeling of running along with them? What if we paint the wind, the clouds and the sky together? Yes, yes, we raise colorful kites that fly up! 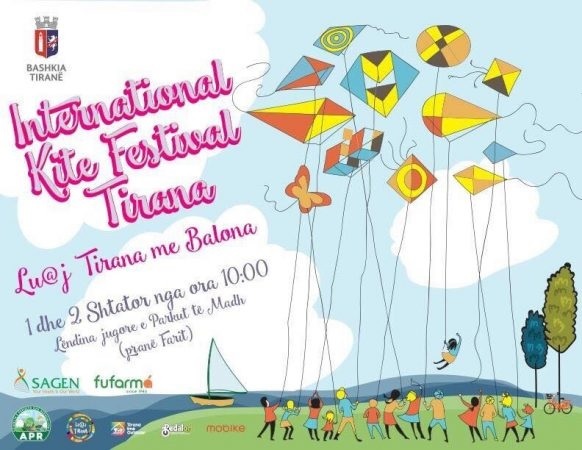 On September 1 and 2, come to the southern lawn of the Great Artificial Lake Tirana, take your kite with you, or come and build it together! For the first time in Albania, a Kite Festival! Many colors, lots of activities, lots of fun! With local and foreign friends!" Writes APR in a status on the Facebook social network.